You have an interview coming up. You've taken care of the big things. You have picked out your clothes, studied the company, reached out to contacts for information, and you updated your resume. 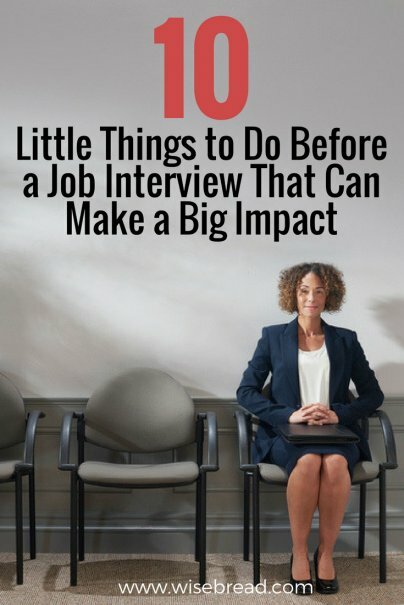 But what small things can you do the day, or even a few minutes, before you walk into that all-important meeting to have a huge positive impact? Even the most confident people get doubts before walking into an interview room. It's only natural; you're about to be grilled for 30 minutes and the outcome could have a massive impact on your life. But it's easy to let those doubts get out of hand, to the point that you couldn't imagine why you'd ever get the job. You've taken care of the clothing, the shoes, the watch, and the overall presentation. But, little things can happen that can become a big distraction. Find a quick moment to go to the bathroom and look at your appearance carefully. Is there anything stuck in your teeth? Is there a stain on your shirt? Is there a stray hair waving around, or an eyebrow hair descending into your view? How about your nails? Are they as clean as they can be (any kind of dirt under your nails is going to come across as unprofessional in most jobs you apply for). Make every effort to take care of the smallest details before you walk into the room. Your breath can have an awfully big impact on a first impression. Even if it's due to something like a few too many cups of coffee or eating something that went heavy on the garlic at lunchtime, it can be off-putting and make you memorable for the wrong reasons. Ideally, you will want to brush your teeth before you get into the interview room. Bring a small toothbrush and travel-sized toothpaste, or better yet, a small disposable toothbrush that comes with its own built-in toothpaste. If that's not an option, mints or gum are a good alternative, but make sure neither of those are in your mouth when you're invited into the room. All those times your teachers and parents said, "Don't slouch" are about to come in handy. You don't want to be so relaxed that you look sloppy, but you also don't want to be as stiff as a board. Sit up nice and straight, elevate your chin a little, and look your hiring manager in the eye. You most likely have a smartphone, so use it. While you're in the waiting room, scan the news headlines. What's going on in the world? Is there anything that could have an impact on the company you're about to interview with? Even if there isn't, being informed on the latest news shows that you're on top of things. The interviewer may well start off the interview with some chit chat about something that happened that day, or the night before, and if you're clueless about it, things can get awkward. You don't need to be an expert, just in the know. A good eight hours of rest the night before can do wonders for your mental state, and you should do whatever you can to make this happen. Turn off any unnecessary lights or electronic devices, as the darker the room the better you'll rest. Turn down the heat, or turn up the A/C. Scientists recommend a temperature as low as 60 degrees for optimal sleep, but between 60 and 67 degrees is the given range. And make sure you have closed all windows and other possible means of distraction; a barking dog at 3 a.m. will not be welcomed. Also, don't use alcohol or medication to help you drift off. They may help you get to sleep, but they do not help you stay asleep. Plan your route, and plan alternate routes just in case something happens. Most GPS systems will give you detour options if you hit a sudden jam, but even they can be a nightmare to negotiate, especially if it is miles to the nearest exit. Why bother? You already applied, your application was accepted, and you're about to step into an interview room. Well, the last thing you want to do is look unprepared. It may have been weeks, or even months, since you last read the job description and you don't want any questions to take you by surprise. In particular, look at the skills or duties required in the role to which you applied. Pick out the ones that align closest with your own skill set and be sure to bring them up in the interview. Remember, you're not just there to answer questions, but to ask them as well. In fact, some hiring managers place more emphasis on the questions you ask than how you answer the ones they shoot at you.